Metaphor is an unremarkable sort of creature. His body is lithe and lean, and follows the breed standards of the Arabian to a tee. He is a ruddy red chestnut color, with a wide white stripe down his face. White socks adorn his feet. 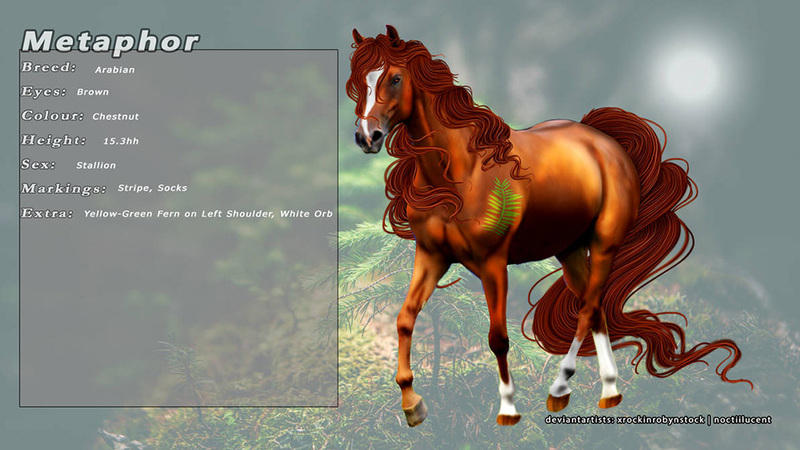 His mane and tail are long, curled slightly at the ends, and are hued a copper chestnut. Much like his personality, he is a simple looking creature – humble and unadorned by magic. The only part of him which is remarkable is a strange, otherworldly looking brand along his shoulder. It is the mark of the earth goddess Maaemo, which marks Metaphor as a faithful follower. The brand is a shimmering green hue, which seems to hover between green or gold colors when it catches the light (though this iridescence is only and illusion). Metaphor is followed by a glowing white orb. The orb is purely decorative, a gift from Maaemo which was once a protective beacon. Later, it housed his powers when he became a skilled healer. But now, it is simply a beautiful light – a reminder of a long life, lived with many coming in and out of it. It lights his path on the darkest of days, and provides him hope for tomorrows. Metaphor is a stoic creature. 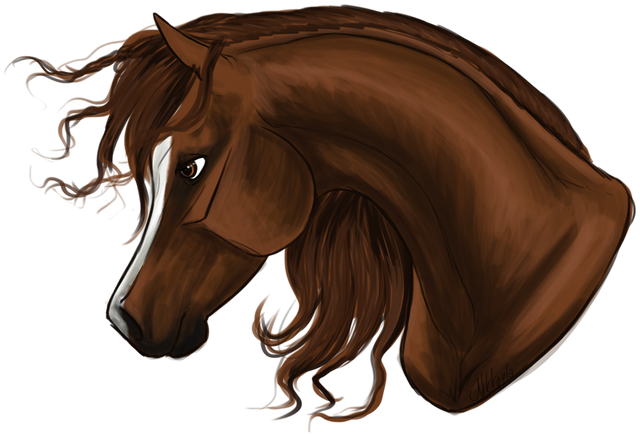 In his youth, he was much more fiery and outspoken, but as he’s grown older, the stallion has mellowed with time. He takes the world in with a quiet sort of contemplation, and can be counted upon for his faithful and dependable disposition. He has a knack for providing a calming presence, which has made him a level-headed advisor for many a king. Not one to want to share in the power, Metaphor is content to stay on the sidelines and support the kingdom without taking on a leadership role. He is humble to a fault, and wishes nothing more than peace and harmony. The red stallion’s calm and steady attitude has made him a prime candidate for raising orphaned foals, and he has taken more than one under his wing. He embraces the role of teacher, mentor, or helper. It is this personality which makes him a natural healer. During his time in Ravos, he honed his craft by focusing his earth magic toward the healing arts. This duty only continued to grow as he moved into healing ranks at the Rift, and now in Novus, he has taken up the mantle once more. He will approach this responsibility in the same way he approaches everything in life – with a selfless sense of loyalty and duty. Metaphor is not one to talk about himself easily. It’s not so much that he’s trying to hide a painful past, as it is the fact that he is not one to shine a lantern on his own accomplishments or woes. Instead, he is an empath, focusing on the needs of others and providing what comfort he can. Because of his personality, it can be hard to know his true feelings… but a few close companions have gotten to know the man behind the mask. Metaphor has a long and storied past. He was born in Ilius, on the banks of the River Enipeus, to the mare Fera. The red colt never knew his father, and he was never spoken of. Instead, he was raised by the herd, particularly by the King of Enipeus – a Clydesdale named Merrick. Merrick had been a skilled warrior, who sought to harness Metaphor’s childlike energy and desire to serve… but fighting was never really in the cards. Though his desire to be a great warrior was strong, Metaphor was always destined to be a gentle soul more than a fighter, and his training never amounted to much. It is here at Enipeus where Metaphor experienced his first bouts with love and heartbreak. His mother Fera was a gentle soul, bringing lost and orphaned foals under her wing, and Metaphor grew up with two ‘adopted’ sisters, Eos and Cade. As children, they played together and learned the ways of the world… but as they grew older, Metaphor began to develop feelings for Cade. He loved her fiercely, wanting nothing more than to lead a happy and fulsome life by her side, but his feelings were never returned. After his mother was killed in battle, scorned and heartbroken, the red stallion ventured out on his own, his heart too bruised to stay in the place with his unrequited love. Thus, Metaphor began his life as a vagabond, traveling from place to place and never staying for long. He went to Dominico, to Chaos, and to the land of Sydan and Ravos. Sydan became the first place since Enipeus where Metaphor really felt at home. Here, he learned the secrets of earth magic, and discovered his true calling of healing. In a story come full circle, he ended up taking lost foals under his wing – much like Fera had done, and raised them to follow the earth goddess Maaemo. But home did not last here either, for Ravos was destroyed by a darker magic – the magic of the Rift. The Rift is the last place which Metaphor roamed before finding his way to Novus. It was a place of wild and untamed magic, one which cared very little for the circumstances of his past. Instead, it was a daily battle and struggle for survival. Eventually, Metaphor learned to make peace of the chaotic magic, settling in the Elysian and pledging his loyalty and heart to the warrior queen Katniss. 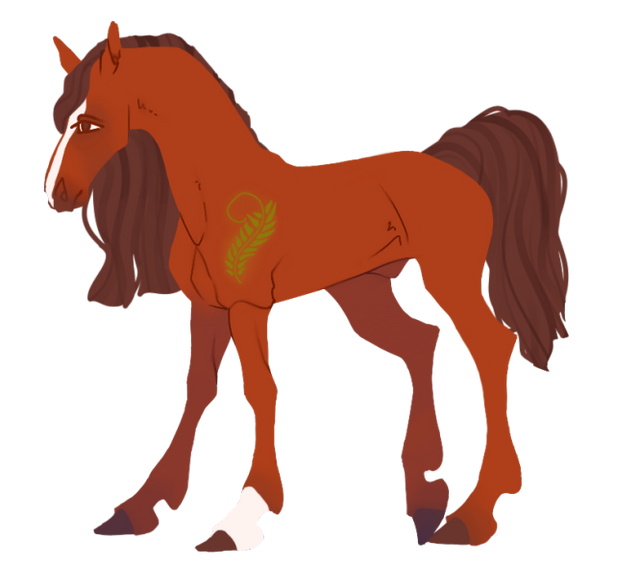 In the same way as Sydan was torn from him, eventually the magic tore apart Rift as well, leaving the red stallion alone and wandering once again. His travels now bring him to Novus… what come next is still to be discovered. Metaphor carries a medium sized medical bag with him - it is an ordinary looking leather satchel, filled with small vials and collection vessels.